What is open heart surgery/CABG? Open heart surgery or Coronary Artery Bypass Graft is a surgical procedure that is used for the treatment of Coronary Artery Disease (CAD) or Coronary Heart Disease (CHD). Coronary Artery Disease is the blockage or narrowing of arteries. Arteries are the blood vessels responsible for the supply of oxygenated blood to the heart. This obstruction is caused due to the build-up of fatty substance in the inner walls of arteries, this is known as plaque. If the plaque breaks it may cause the formation of blood clot in the arteries thus blocking the blood flow to the heart. This plaque may even harden which results into narrowing of arteries thus narrowing the path for blood flow. The early signs of CAD or CHD are pain or discomfort in chest which is also known as Angina which finally may result into heart attack. Diet is also a factor. High fatty diet also affects your heart which may lead to CAD. Sometimes people me not discover early symptoms and thus the blockages gets severe and may result into heart attack. There are certain ways to treat Coronary Heart Diseases, CABG procedures is one of them, grafts are used in the bypass procedure, these grafts are veins from other body parts such as legs or wrist may be used. These grafts are attached around the blockage, one end above and the other below the blockage, thus it is known as bypass as blood passes through this new graft attached and reaches to the heart. This procedure is known as Coronary artery bypass graft or open heart surgery. During CABG surgery the heart is stopped as it is a delicate procedure thus it is known as open heart surgery as the heart is exposed for grafting or bypass procedure. The surgeon inserts tubes in the heart for pumping the blood. This process is carried out through a cardiopulmonary bypass machine which is needed to pump the blood. Cardiothoracic surgeons perform this open heart surgery. The open heart surgery cost is high as compared to other surgeries. This cost depends on the city as well as the hospital; some hospitals have special low packages for heart patients who are underprivileged. 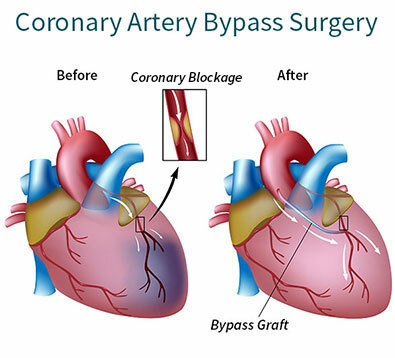 Coronary artery bypass graft surgery in India is now very common and there are special hospitals also who have experts and surgeons who have specialized in this. Other treatment for Coronary Heart Diseases is angioplasty which is a non-surgical procedure also known as percutaneous coronary intervention (PCI). A small tube is placed in the coronary artery which helps to open the blockage in the arteries. These two treatments can be used to treat severe heart blockages where pumping is already reduced. If PCI procedure doesn’t work then you may opt for CABG procedures or open heart surgery. Traditional CABG is the usual type of bypass surgery in which at least one artery is bypassed, this is an open heart surgery where the chest bone is opened and heart is exposed. The heart is paused by some medicines so that the surgeon may perform the surgery on still heart. The bypass machine is used to keep the blood moving in the body and after the surgery the hearted is restarted with the use of electric shocks. Off-Pump CABG is same as Traditional CABG but it is done in beating heart that is the heart is not stopped. There is a large cut or incision is made in the chest. This type does not use the bypass machine; it is also known as beating heart bypass grafting. This procedure is beneficial for fast bypass surgery recovery and minimizes the complications of using the bypass machine. This type is called revascularization which is used to improve the flow of blood to the heart with the help of grafting or bypass veins of other parts of the body. Benefits of coronary bypass surgery are that it creates new routes for the easy flow of oxygenated blood to the heart. After CABG procedures patients need to stay in the hospital for a few days as prescribed by their physician. Coronary artery bypass surgery recovery differs from person to person as everyone respond differently to the surgery. In the usual process of recovery the patient must be able to sit in one day of surgery, walk after 3 days and use the stairs in 5-6 days. The normal duration for getting back to routine life may take from 6 weeks up to 12 weeks. You may need to take care of the cuts made during surgery. Your doctor may prescribe you some painkillers for some days, wear loose clothes and eat healthy food for the smooth recovery. Avoid rigorous activities like driving, cleaning, carrying kids or heavy objects, fast walking or jogging may harm your wounds. It is normal to feel low and less energetic due to surgery, you may experience mild side effects also but there is nothing to worry as it takes time to recover from this serious life saving surgery. So go for frequent visits to your doctor and have patience as coronary artery bypass surgery recovery is a slow process and may take time. Life after CABG need a lot of care and attention towards your health especially your food. After full recovery of the surgery it is very important to take up a healthy routine and avoiding certain things that may harm your heart. Try to exercise daily, walking is the best way to stay fit and keep your heart healthy. Avoid alcohol as much as possible and stop smoking completely. Eat healthy food and avoid junk, oily and fatty foods. If you are overweight then try to lose weight. Finally go for regular check-up and maintain a healthy cholesterol levels. Life will come back to normal after coronary artery bypass surgery if you maintain your lifestyle and follow a healthy routine.